I know there are so many choices when it comes to finding the right Selfie Stick/Monopod. Today, I am highly recommending a product that includes an iStabilizer Mount (usually sold separately)…all for only 22.43 dollars! Take your mobile journalism to the next level or simply improve your self photography. The iStabilizer Monopod works with virtually all Smartphones and POV cameras including GoPro, Countour, Drift, and light camcorders. The INCLUDED iStabilizer Mount can be used on any tripod with a standard ¼ x20” camera mount. 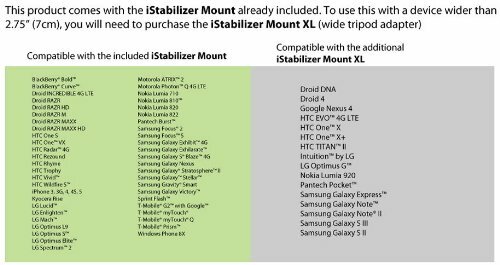 If you have a phone that is wider than 2.7″ (70mm) you should also purchase the iStabilizer Mount XL. I recommend the Mount XL for Samsung Galaxy S4/5, Note 2/3 and other wide devices. This can be used with a GoPro too! You will need a GoPro Tripod Adapter. Besides it being fashionable, it extends to over 3 feet. It is made of airplane grade aluminum. It works with a standard point-and-shoot camera. It is lightweight and collapsable, making this pretty easy to have with you when you need it. It allows you to raise the camera above the heads of a crowd. You will only want to do this in video mode, since once it is up in their air, you can’t snap photos without the remote shutter release. 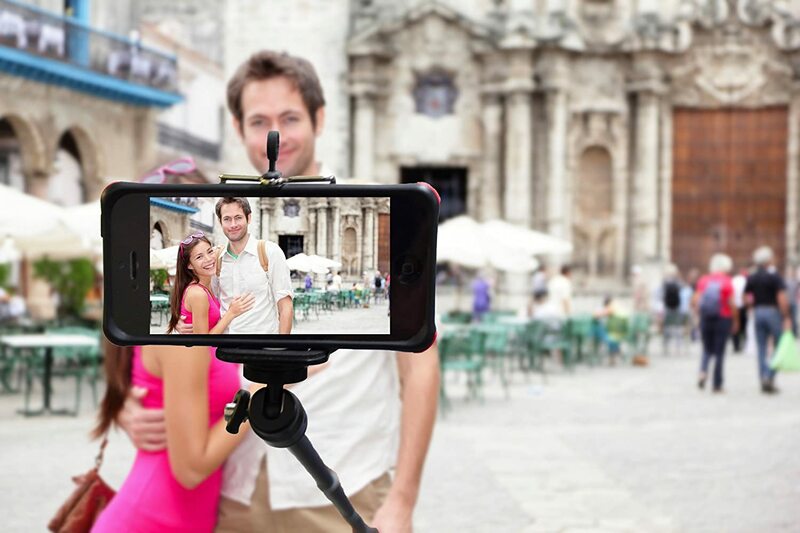 It allows you to take video – with you and/or others using the front facing camera…just like a video Selfie. It allows you to shoot video of yourself while walking or turning around, which creates the illusion you have a photographer shooting the video. This is great if you are making a documentary. The Monopod uses a standard tripod thread (1/4″ ) so you can use it with any standard digital camera. Note: a DSLR or large camera will be too heavy to use with this product. All iPhone devices and cases, including Otterbox, will work just fine with the standard mount that comes included. This entry was posted in Uncategorized and tagged amazon, android, iphone, iphone 5, iphone 6, iphone 6 plus, istabilizer, monopods, reviews, selfie sticks, selfies, smartphone. Bookmark the permalink. ← PicStick For iPhone 6 AND iPhone 6 Plus! This website is text book perfect for the marketing of a single product. I have used it as an example for new internet marketers. Hey, David! I appreciate your thought process and I am thrilled you like it enough to share with new internet marketers. Be sure to stop back. Thanks, again! Great idea! Such a cool tool! This will be my step-daughter’s next birthday present! Great Blog and site, too! Keep up the good work, Deidre! Well, thank you for your nice words! I appreciate you taking the time to check these out and your step-daughter will love you forever…LOL! Thanks, again! It makes taking a Selfie easier! They sure do! You should check out my YouTube video having to do with summer fun! Thanks for your visit! Hi there…another great article. Technology is just so cool! There are so many new tech items to play with and create great Selfies. Great job and I love the site. Oh yes…there are so many cool sticks now to do just about anything?! Thank you for visiting and please come back! I see you have superior thinking, demonstrated above. Thanks! Great! I like to think so…lol! I see you like this underwater Selfie Stick! Thanks for stopping by and please come back! This is great! I am planning on getting one soon. Yes! Please do! Thanks for stopping by and I look forward to your sale…lol! Very cool Selfie Stick! These sticks are becoming very popular. I think this will be perfect when traveling! You don’t need to ask anyone to take your picture. Great review of a great product. Well, I have to agree with you…these are very cool gadgets! Hopefully, sales will be through the roof, come Christmas time! LOL! Thanks for stopping by and please come again! Great news…LOL! Thank you for checking these sticks out and please come again! There’s no doubt about it that is a very cool item. I don’t know what my next camera will be, but the iStabilizer does really extend it’s use. Gotta get one. Thank you! I wish I had invented it…LOL! I appreciate you stopping by and pleae come again! Get one…LOL! What an excellent accessory to have. Do you know how short it is when not extended? It’s definitely something that we’d love to take with us on vacation! Hello! Yes, it is 15 inches long. The length, width, and height are 1.5, 2, 15. I want to see some of your amazing pictures…LOL! I love mine and there are a lot of great pictures and videos using these sticks! Thank you for your visit! These sticks are sure making the rounds…aren’t they? I have posted Selfie Sticks being used on airplanes too! Thanks for stopping by and please come again! Yes, they are cute and lightweight! Thank you for visiting and please come back for your next gifts…lol! Interesting toy for self photography. Nice. Thank you and yes…pretty cool gadget! I appreciate your nice words and thank you for taking time to visit! I guess finding useful, reliable information on the internet isn’t hopeless after all. Thank you! LOL…that’s the truth! Glad you found useful information and please stop back!